Between the first round post and this one, West Indies had named the Test team to tour Australia beginning next month. Of those selected only three were on the first Round team of the week, while only one made the selection this edition. A week ago the issue of diminishing returns in the Fast bowling department was highlighted, with that department showing improvement in round two. Two Fast bowlers had five wickets hauls this round, up from none in round one. The key cause for concern this week was the fact the only two of 12 openers had a score of fifty plus; demonstrating another weak link in the regional game. Jamaica Scorpions hosted Windwards Volcanoes in the more competitive of the two matches with results. Andre Mc Carthy (92) leading the batting for the Scorpions just missing a hundred earning him a place on the TotR. There were starts for John Campbell 43, David Bernard 43, Nikita Miller 39, and Damion Jacobs 40. For Volcanoes Liam Sebastien scalped seven wickets in the first innings narrowly missing on the TotR. Mervyn Matthews and Shane Shillingford had five wickets each in the second innings. Batting for the Volcanoes, Sunil Ambris scored 89 and 40 in a losing effort. Devon Smith had his second second innings fifty of the season. Nikita Miller’s nine wicket haul won the match for the Scorpions earning him the man of the match. Guyana Jaguars continuing their prolific form from the 2014-2015 season completed a compelling innings victory of Leewards Hurricanes. 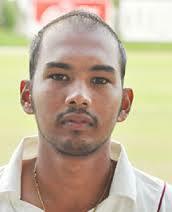 A massive hundred by Vishaul Singh (150) similar to Rajendra Chandrika’s 146 in game one led the Jaguars. Shivnarine Chanderpaul rolled back the years with a half-century of his own. Steven Jacobs was unbeaten on 63 while there were starts from Christopher Barnwell 48, and Anthony Bramble 42. Bowling for the Hurricanes Alzarri Joseph (5/99) recorded the first five wicket haul for a pacer this season, he was supported by Offspinner Jacques Taylor who had 3/70. Leewards were stumped for 85 in the first innings by Gudesh Moti-Kanhai who scalped 6/20 to added to his second innings tally of 5/85. Steven Jacobs had 3/97 with only Nkrumer Bonner 89 and Daron Cruickshank 57 offering any resistance in the second innings. In the closest of the three matched Barbados Pride and Trinidad and Tobago Red Force played to a draw, which was dominated by the batsmen. Sharmarh Brook led the way with a century and a half-century, 111 and 55. Kraigg Brathwaite scored 72 in the second innings with starts for Roston Chase (59), Shane Dowrich (48 and 40) and Kyle Corbin 46. For the Red Force Imran Khan had match figures of 6/165 with Shannon Gabriel supporting with 4/101. Batting for Red Force there were starts for Steven Katwaroo 64, Kyle Hope and Yanick Ottley 45 each, along with 41 from Evin Lewis. For Pride Kevin Stoute was the best bowler for a second consecutive week with 5/83. This entry was posted in Dyon Ravello and tagged Alzarri Joseph, Andre McCarthy, Barbados Pride, Gudesh Moti-Kanhai, Guyana Jaguars, Jamaica Scorpions, Kraigg Brathwaite, Leeward Islands Hurricanes, Mervyn Matthews, Nikita Miller, Nkrumer Bonner, Sharmarh Brooks, Steve Katwaroo, Sunil Ambris, Trinidad and Tobago Red Force, Vishaul Singh, Windward Islands Volcanoes. Bookmark the permalink.